Effective January 1, 2019, nightly RV site rates will increase from $45/night to $48/night and nightly RV Holiday rates will increase from $50/night to $53/night. All existing reservations will remain at the previous rate. Thank you for understanding and helping us take care of Golden Pines! Our park offers 24 RV sites that can accommodate an RV up to 45' and over a dozen tent camping sites. Every one of our RV sites is equipped with full hook-ups. Don't have an RV of your own? No problem! We have cabins and 5th-wheel trailers available to rent. Your mountain cabin on wheels! Golden Pines offers yearly "vacation lease" site rentals. Inquire about our current availability. 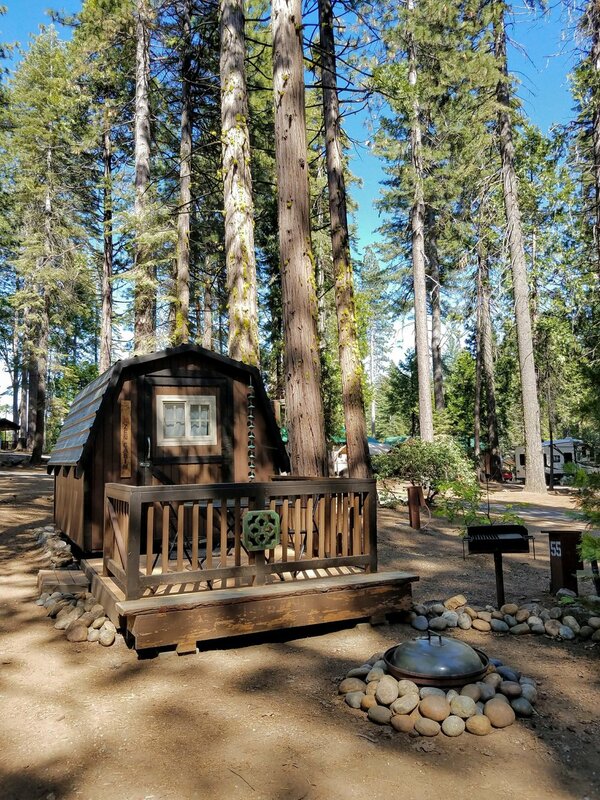 Please give us a call at (209) 795-2820 to schedule your getaway! Interested in being a Camp Host? Join us at Golden Pines! We are now accepting applications for the summer 2020 season! Bring your rig and enjoy life in the Sierra Nevada mountains in exchange for approximately 14 days of work per month.